Make juicy, crunchy and spicy Crispy Fried Chicken at home with this simple recipe. A popular recipe for parties, this dish is a classic when it comes to finger-licking fast food. Combine the buttermilk, little salt and tabasco sauce in a bowl. Arrange the chicken pieces in a tray and pour the marinade over. Cover and keep the tray in the fridge for 6 to 7 hours. Mix the maida, 1 tsp salt and pepper powder. Remove the chicken from the fridge and keep aside for a minute. Heat oil in a large and deep frying pan over medium flame. Dredge the chicken pieces in the flour ensuring it is well coated. Add it to the hot oil and cover the pan with a lid. Fry till the chicken has a rich brown crust and well browned. Pierce it with a knife to check if the meat is tender. The whole process should take about 30 to 35 minutes. After each piece is fried, remove the bits from the bottom of the pan. Transfer the chicken pieces to a serving plate. Serve hot with sauce of choice. 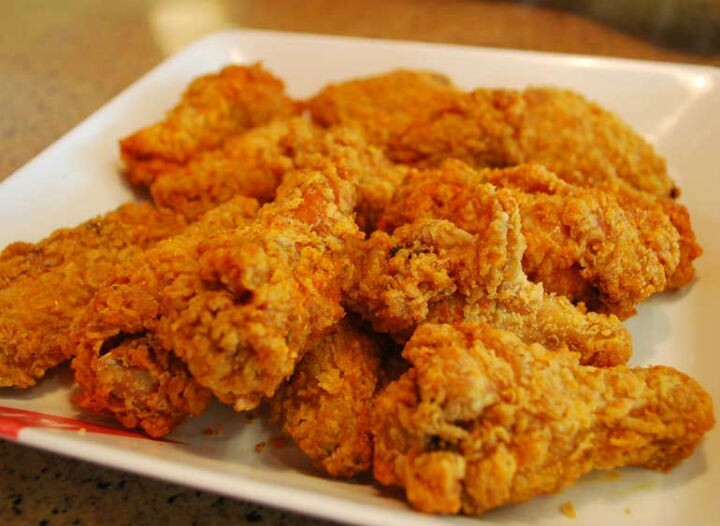 Feel free to comment or share your thoughts on this Crispy Fried Chicken Recipe from Awesome Cuisine.